Dr. Cabrera has been in the dental field since 1999, and since that time, he’s learned that the key to truly excellent dental care is a strong and trusting relationship between a patient and their dentist. When that relationship is solid, patients are more likely to report problems, attend appointments, and give Dr. Cabrera the information he needs to personalize his care to each unique individual. He would love to form this kind of bond with you and your family, but first, you can start getting to know him by reading on below. For Dr. Cabrera, dentistry runs in the family. His brother and sister are both dentists, and he followed in their footsteps because he liked how they were able to help people improve both their health and confidence at the same time. He also enjoys being able to provide such an essential service for the community that can make a big difference in people’s daily lives. 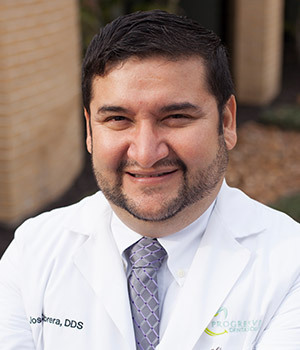 Dr. Cabrera attended Loma Linda Dental School in California, and shortly after graduating, he started practicing in Laredo. In 2014, he relocated to Houston with his family and joined the Navy Reserve. He eventually made his way to Humble and New Caney where he is proud to practice today. Over the course of his career, he has constantly strived to improve his clinical skills and scope of care, which is why he has taken a lot of continuing education in the fields of orthodontics and implant dentistry. He also maintains active memberships in both the American Academy of Implant Dentistry as well as the American Orthodontic Society. Away from the office, Dr. Cabrera likes to spend most of his time with his family, either fishing or playing basketball with his son. He’s also an avid cook, and he especially likes making dishes that come from his native home of Peru.